Added two single fans to either end of the tank as the weather is heating up in Perth, hopefully they help. 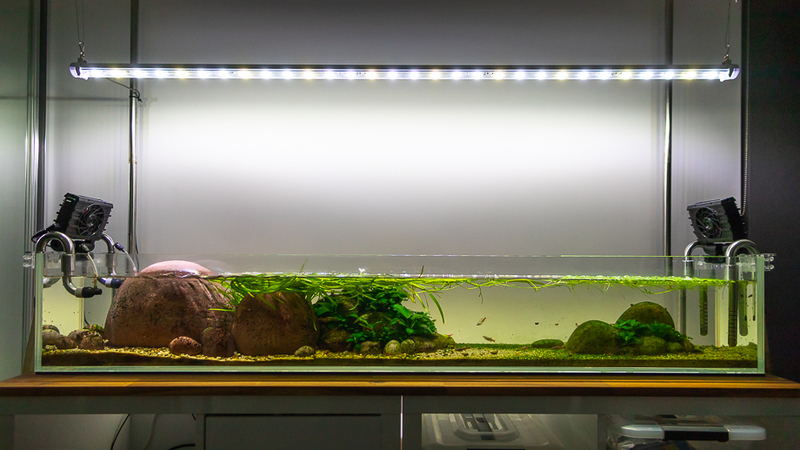 Cleared out most of the frogbit, amazing how much brighter the tank looks, gotta try keep on top of clearing it out. The flowers from the Cyperus helferi now pretty much stretch the length of the tank. Updated photo below. I noticed lots of dead flickr links in some posts, I tried to apply a watermark to my lightroom library and re-publish the photos, which in-turn broke all the links, crap thing is I then decided I didnt want a watermark and re-published again, lesson is if you have flickr images published on forums etc dont re-publish the images as the links with break. I have found that fans help to reduce temperature up to 5 degrees in usual tanks. If it's in a styrofoam container, I've been able to keep 18C in 35 degree days!! Massive evaporation though, as expected. Loaches doing ok? I was recently reading up on their habitats and realised they live in very cool waters. This no doubt helps the O2 as well. yah I am hoping they can drop the temp a few degrees, last summer tanks in this room got up to 28c. Yes the loaches prefer / need cooler water, as you said so the o2 levels stay high... summer will be the real test. Loaches are doing well, I did loose 1 a few weeks back but it had a injury from the store. Nitrates where very high so I did a full clean of both filters last week and added a bit more media to one of the filters that only had sponges, vac'd the sand etc, tho I would assume there is a build up of crap around the big stones, I cant get in there with a vac.. Tried to capture a timelapse of the last hour or so of my light cycle, didnt really turn out how I wanted... probably better of just capturing a few hours when the light is more powered... will give the timelapse another go soon. Looks so good! Do you know this biotope contest? you should participate :P or at least I know you'll enjoy the videos, tanks are stunning. 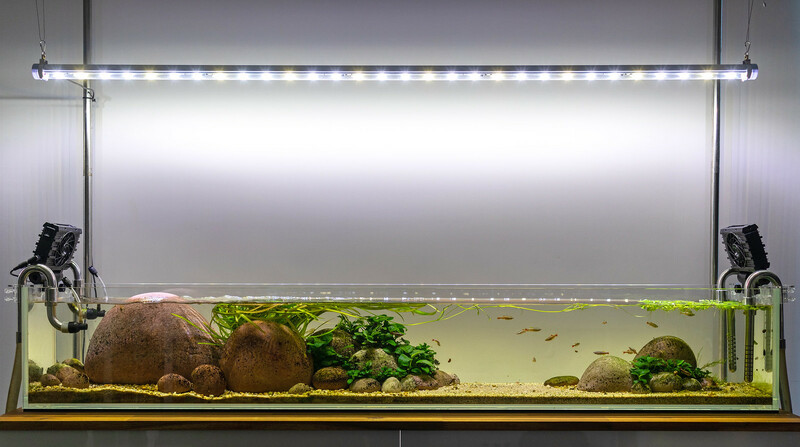 cheers, I have seen some of the biotope contest stuff, some very cool tanks, I dont think they would consider this a biotope, tho I have never really looked into it! Currently breeding 15+ different killifish! How's the temp holding up? Cheers mate, do it, its fun and unique! So far so good, it has not really got to hot here yet, was around 27 - 28 on the weekend and the tank held steady at about 21-22, I have just been turning on the fans manually in the morning and off at night. Recorded this 4K time lapse today, works much better than recording the fading light... It is about 1 hour compressed down to 40 seconds, watch in 4k on youtube for extra detail. One of the loaches just gets onto the glass at the end of the video, would be cool to see what they do when on the glass... but the SD card could only hold about 1000 photos... I plan to try take a longer time lapse some day soon, need to figure out best way to managed file size, perhaps I could tether the camera to my laptop or something, also need to keep the camera powered, at the moment just runs from the battery and wouldn't last any longer than 1000 photos either way. Also i should have put some food in the tank to louer the loaches out a bit more, you get the odd glimpse of them. Mine used to eat a bit of algae on the glass (GDA) but only a thin layer because you could still see the algae but less than adjoining areas. Perhaps you can turn your output towards the front glass to entice them. Time lapse looks good. IF you can get hold of a slider, you can make the shots more dynamic. Yeah they do clean the glass a bit, tho dont full remove the GDA / Green algae as you said, I have not cleaned the black glass in along time and its getting a nice green film, which I will leave for the fish. Check out the green algae on the sand, green algae has gone crazy, the glass is covered, tho hard to tell in the photo, seems the loaches do a good job munching it down but never fully remove, if you look closely you can see the pattern they leave in the algae, kind of like qtr moon shape, will have to see if I can get a macro shot of it. Last edited by doylecolmdoyle; 06-12-18 at 08:32 PM.